Another from Utah canyon country. Getting around to some more processing. Sunrise, I had the place to myself for the first half of this, then a few other photographers straggled out. Before the sun actually came up the sky was ablaze, unfortunately, either through something I did, or my lens messing up, the corners seemed horribly OOF. I have to do some testing on my lens. I find scenes like this extremely difficult to capture in a way that can really portray the magnitude and awe of actually "being there." That said, I think your image, printed out as large as possible, would be somewhat stunning. You've caught some really nice texture and a great array of tones from a perspective that delivers dimension. 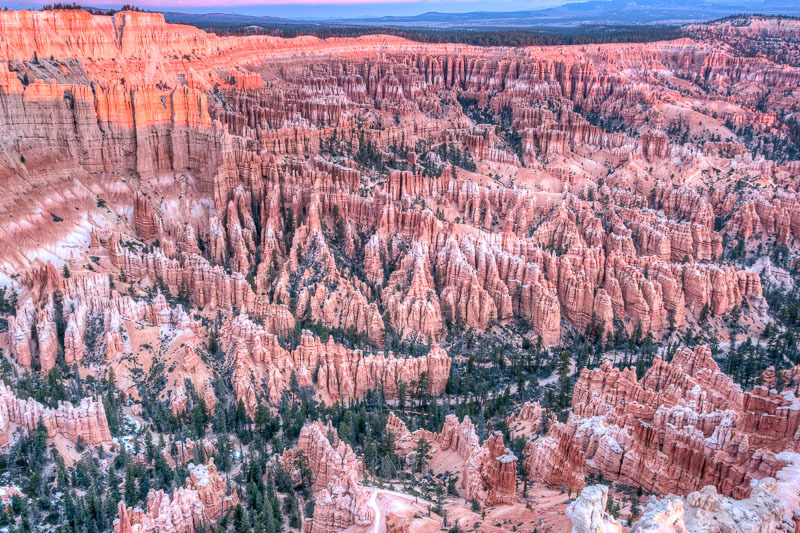 I believe that a later capture, which you probably have, that shows the sun hitting more of the hoodoos in the upper third of the frame would be better. Hmm.. what do you mean by off,... do you mean soft? Not too obvious here, but perhaps you already cropped out the corners, as the ratio doesn't seem to be 3/2. My first impressions are ... Brrrrr, it was cold out there (more on that below). The second is, seems a tad overexposed on my monitor (and I just calibrated it with a Spyder). It may also be a tad over-sharpened, but hard to tell for sure. Funny, I was out there three years ago at I believe the same spot, just a few days after Xmas, and it was about 2F at sunrise. There was about 10 photographers standing on an area seemingly popular for photography - prob the one you were on here - and with the wind chill it was probably about -10F or -15F, as my face would freeze if I faced it too long, had to keep turning away every 20 seconds and warm up. My pix were OK but not great, and I am still not sure why. I also had lens issues on my trip though; I had just gotten my full frame D700 and didn't realize how terribly soft my Tamron 24-135mm zoom was in the corners since they were automatically 'cropped' by my D200 (which is not a full frame camera). I was a bit upset when I realized what happened, haven't really used that lens since, looking to sell it to someone who has a smaller frame sensor ..
oof (out of focus), not off, although off is also apropos. The corners especially the left side are pretty soft, I cropped out most of the worst of the softness for this post, and probably over sharpened a tad to compensate. 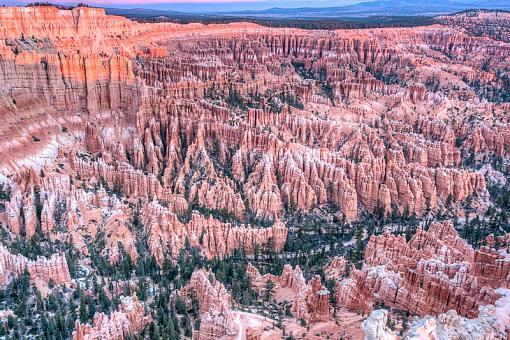 This was taken from Bryce point, there was little to no wind, I was on a solid tripod (Gitzo 3 series), and shooting at f/11 with one of my sharpest lenses (Canon 28-70mm f/2.8L). It wasn't nearly as cold as it was for you, I think it was around 28F. As for overexposed, I think I've definitely clipped the edge of the red and orange channels, these wide dynamic range shots are difficult to process for me, I need to take some lessons from Marc Adamus, and revisiting this today, the foreground maybe does look a tad bright, I probably should do a small levels adjustment there.